Beekeeping in India is a growing trend. Honey bee farming in India can be done as a stand alone commercial honey bee farm or can be integrated with crops to increase the crop yield and get additional income from honey. Discover how to start honey production in India with complete apiculture information. Rearing of honey bees or beekeeping is called Apiculture (madhumakhi palan in Hindi). Beekeeping is as old as history. Honeybees have found a place in literature, philosophy, art, folklore and even architecture. In fact, it is said that bees are one of the most widely studied insects in the world. While some admire their hard-working nature and division of labor, some find inspiration in their co-ordination and teamwork. In other words, beekeeping or bee farming is a widely practiced and attractive form of farming and way of life. Maintaining a beehive in an agricultural farm is not a new concept. Honey is a commercially important product since times unknown and a human going to forest to collect honey is well-known. Maintaining a beehive in a farm promises additional income to farmers. In addition, it does not require huge investments, infrastructure or even a fertile land to start bee farming in India. In agricultural, honey bees do not compete with the crops for resources. On the other hand, it helps increase agricultural productivity. This is because bees play an important role in pollinating many plants. Sunflowers and such other crops are highly dependent on bees for pollination. Honey produced by bees is of high commercial value. When honey is collected from the forests by traditional method, the bee colonies are destroyed. By raising them in artificial hives the colonies are preserved. Apart from honey, there are other commercially important by-products like royal jelly, bees wax, pollen, propolis and bee venom. It is a secretion from the hypopharyngeal glands of nurse-bees. Queen larva and the young workers feed on royal jelly. It is milky in color and contains proteins, lipids, carbohydrates, minerals like iron, Sulphur, copper and silicon. It increases the vitality and vigor in humans. Beeswax is secreted as a liquid but solidifies when exposed to air. Scales are formed after solidification which is removed by the hive-bees for building the comb. Although the wax is white in color, the shade varies depending on the pollen pigments. It is chiefly used in the candle industry. Other major places where the bees wax is important are for making creams, ointments, capsules, deodorants, varnish, shoe polish, etc. It is a viscous fluid produced from the flower nectar by the bees. Commercially it is the most important product of apiculture since it is a whole food containing sugars, antibiotics, enzymes, acids and minerals. Since it has a high sugar content, it is a high energy source. It is a useful carrier for many ayurvedic and unani medicinal preparations. In severe cases of malnutrition, ulcers and impaired digestion, honey is recommended for regular consumption. Propolis is the resin-like exudate collected by honey bees from the trees. It is used by them for sealing the cracks and crevices. It has an adhesive quality and hence mixed with Vaseline. It also has burn healing property and used for preparing ointments that treats cuts, wounds, etc. It is an important secretion used by the worker bees as a defense mechanism. It contains active chemicals like histamine, hydrochloric acid, formic acid, calcium, Sulphur, apamine, etc. Commercially it is obtained through electric shock. The hives are connected to a live circuit of 12-15 volts. Whenever the bees get in touch with the wire they receive the shock which irritates them and they react by depositing venom. Bee venom is injected into patients suffering from rheumatism. They cannot be cured by any other method. It also helps in curing neuralgia, endoarthritis, necrosis, etc. Genus Apis has six species of which four types of honey bees are found in India. They are Apis florea, A. cerana indica, A. dorsata and A.laboriosa. Dwarf honey bee or Apis florea are the smallest of honeybees and often mistaken for stingless bees since they do not sting easily. They prefer hot and dry climate so they are found in plains and sub-tropical areas. 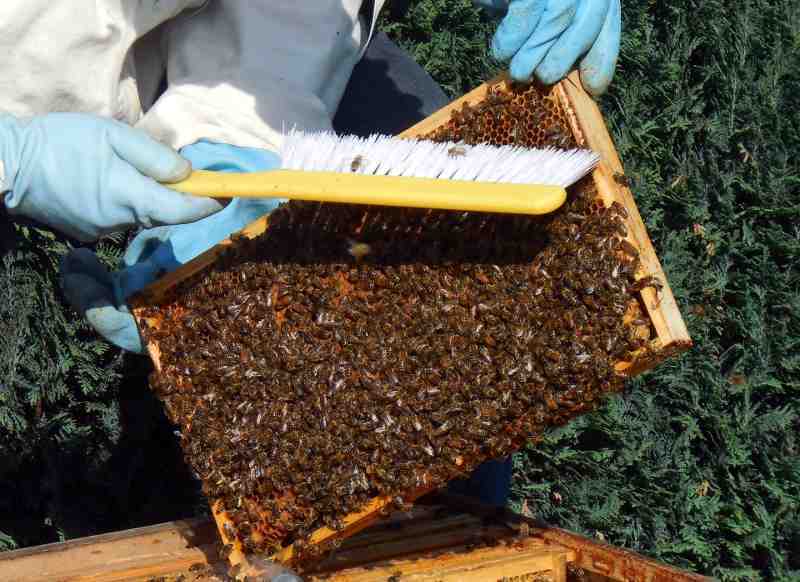 Their comb shows a distinct honey portion at the top. They usually build their nests in small trees with dense leaves or in closely placed plant stalks like those of jowar or rice. These bees build their nests out in the open and are given a support underneath such as using a tree branch, rock cliff, etc. This is one reason why they are called rock bees. They build the largest hives with some measuring up to 200 cm X 150 cm in dimensions. They are semi-circular and hang from above. They even forage during moon-lit nights. Forest honey hunting is commonly carried out with rock bees. Gandhiana- They are dark and large. Indica- They are yellow colored and smaller. Gandhiana is considered to be of the plain variety. They make combs in cavities like those in tree crevices, rock cavities etc. They exhibit an absconding tendency yet they are one of the domesticated varieties. It has a gentle temper. It is a good honey gatherer. It can protect itself and the hive against its enemies except wasps. It adapts very easily to frame hives. Being social insect honeybees have divided their society into different castes viz. 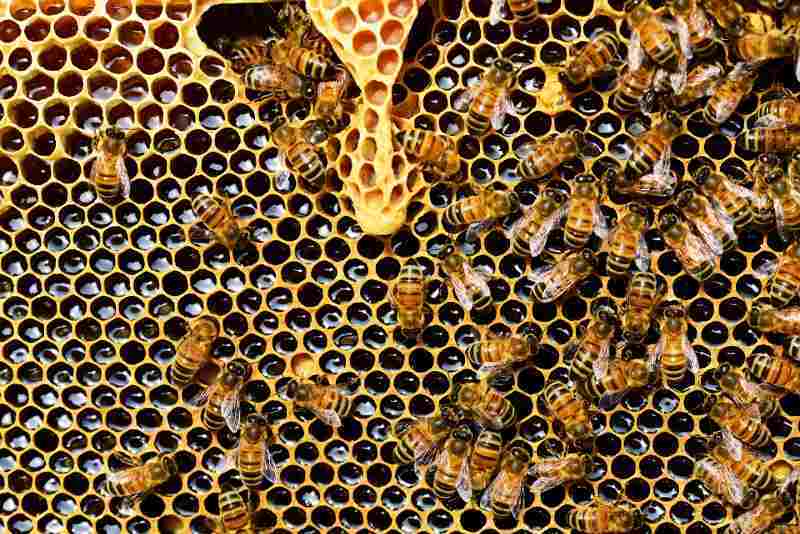 drone bees, queen bees and worker bees. They are the male bees developed from the unfertilized eggs. Larvae developing from unfertilized eggs are fed on the royal jelly by the worker bees thus giving rise to drones. Their main purpose is to mate the queen bees and fertilize the eggs. The male bees are taken care of by the worker bees till the queen in the colony is mate. After mating the drone dies. Similarly, once the mated queen returns to hive, the drones are neglected by the worker bees. Queens are the fertile female of the beehive. Every hive has one queen who stays in the colony for about 10 days till the period of maturity. Once mature they go out on mating flights. Post mating, they return to the hive to play the role of queen mother by laying the eggs. They normally lay up to 15,000 eggs per day. However, it is the availability of food royal jelly that controls the egg laying. Queens can live up to 3 years but their effective fertilized egg laying period lasts upto 2 years. The worker brood cells in the hive receive the fertilized eggs while drone cells receive unfertilized ones that develop into worker and drone larvae respectively. They are infertile females developed from fertilized eggs. It is the number of workers that determine the strength of the hive and success of the honey bee farm. They are smaller than drones and queens and have a strong influence of the pheromones produced by the queens. It has a lifespan of maximum 6 weeks. The first two weeks following birth is spent in doing indoor duties like cleaning the hive, nursing the young, repairing the damage parts of the hive, secreting royal jelly, attending the queen, etc. The next 3 weeks are spent in outdoor duties like gathering nectar, pollen, water, ripening honey, etc. It has no individual identity but spends its life doing well for the colony. On an average it makes about one- twelfth spoon of honey in its lifetime. Apiculture has its own set of challenges. Some of the problems and possible solutions of beekeeping in India are described below. This is one of the most important steps. The farmer must gain adequate knowledge on the beekeeping process, zoology of the bees, bee-human relation, sting management, etc. It is advisable to acquire training from the local beekeeping authority. Government organizations like National Bee Board under the Agriculture Department and Central Bee Research Training Institute provides training to farmers in apiculture. In addition, it is advisable to work with local farmers before starting beekeeping since it provides hands-on experience and latest apiculture information. Once adequate experience is gained the next step is to plan the apiculture process. For this it is necessary to decide on the site, type of bee, equipment to be used and last but not the least- place of marketing. Having good knowledge about the ecology of the place and the flora helps the farmer in deciding the kind of bees to be reared for honey production in India. Flowers are the chief raw materials needed for honey production. Plants contain nectar and pollen both of which are essential for the survival and growth of honeybees. Consuming these raw materials bees manufacture honey, beeswax, royal jelly, etc. India being a predominantly agricultural country and forested land, natural vegetation is in abundance. This is especially true about parts of Western Ghats, North Eastern regions like Assam and Sundarban forests. Therefore, these areas are said to be more suited for the bee life. A mellifera which was introduced to India depends cultivation of crops like arecanut, coconut, mango, palm, cashew, cinnamon, cumins, fodder legumes, cloves, ginger, turmeric and such spice crops for survival. Plantations of tamarind, eucalyptus, gulmohar, etc. also boost honey production. Pulses, trees of citrus fruits, fence plants like mulberry, jatropha, rubber, etc. are also important for bee production. Statistics show that in parts of India where rubber plantation is in abundance they are the single and largest source of nectar for honey production. Similarly, litchis prove to be an excellent source during its flowering period, i.e, during the months of March to May. Cereal crops like maize, jowar and bajra are viewed with adequate importance for the pollen. Study has found that substantial amount of increment in yield is possible by bee pollination. The place of beekeeping must be dry. Humidity, moisture and dampness affect the quality of honey and the bees’ flight. The place chosen must be protected from harsh sunlight. It is preferred to keep the bees in shaded areas as they are protected by direct sunlight and the breeze keeps them cool. The place of rearing must also have a clean drinking water source. The most important requirement is that there must be plenty of forage or plants that yield nectar and pollen for the bees near the hives. Beekeeping has been practiced in India since ancient times. Therefore there are different ways of rearing honey bees. Bees are reared in clay pots in parts of south India. Air holes are punched in the pots, smeared with beeswax and kept in gardens. They act as instruments to attract the swarms. Once the colony is set, another pot is inverted over this. Once the rains set in the pots are overturned and honey is harvested. Trunks of trees or hollow wooden logs are used as hives. However this is in altitudes above 1800m sea level. These are common in the northern states like Jammu and Kashmir, parts of Himalayas etc. They are basically empty spaces on eastern side wall of the house. It is a support structure that forms the base of the hive. It generally has four legs. It is a drawer like tray which is raised on all four sides by runners. However, in front it is an alighting board so that the tray can be pulled out if need be. Unlike the name it is not a box but a frame rectangular frame in which scooped shelves are cut. They are cut along the length of the box. They are again wooden frames with the sides serving as top and bottom bars. The under-surface is grooved to serve as receptacle for the edge of comb foundation. The top bars extend beyond the rest of the brood box. The comb foundation is supported by four wires fixed between side bars. These wires act as mid-rib. The cells are constructed by the bees on the sides of the frames. The frames are kept apart so as to leave enough bee space. This is a wired frame. The size of the wire is big enough for the workers to pass through but not fpr the queen. Hence the queen has to stay in brood box which is between the brood and super chamber. This is the chamber wherein honey is stored. The frames are similar to brood box except that they are shorter in height. Since it is used for storing honey, this chamber is also called honey chamber. The hives have two covers on top- inner and outer. Inner cover protects the bee nest and maintains the humidity and temperature within the hive. The outer cover on the other hand acts as a roof and provides protection from rain and sun. The wooden planks also have ventilation holes in them. No beehive can function without honeybees. 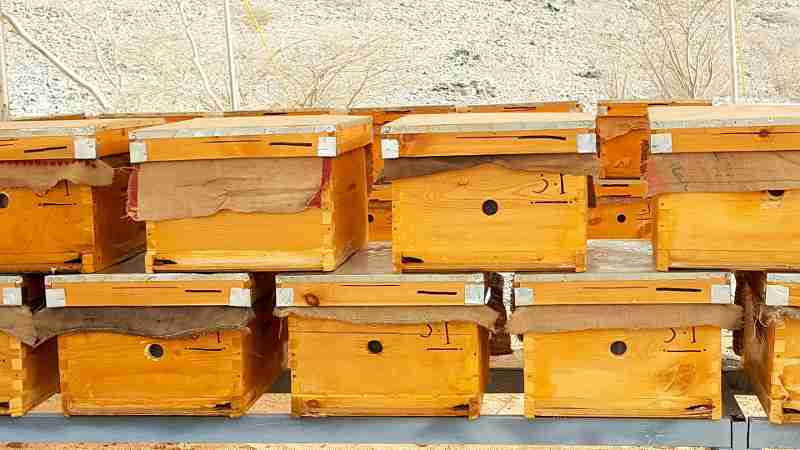 The combs and bees are removed from their natural nests and placed in the wooden hive. This practice is normally done in the early morning or late evening. The weather is typically clear and the sun is mild during this period. Another way is to place decoy hives at different spots. The spots must be places wherein the bees are likely to swarm. Once a swarm settles, the decoy hive is taken and the colony is transferred to the movable hive frame. Since the workers do not stay in a hive without queen, a queen’s presence is necessary. Generally, when a colony is procured it must contain a young queen bee and a swarm of worker bees. Although queen bees can lay eggs for 3 years, on an average they can lay fertilized eggs for a year or maximum two years. After this period they start laying unfertilized eggs. This affects the colony. Generally farmers revive the colonies by placing another queen bee. This process is called requeening. In apiculture, farmers are advised to requeen their hives after every one and half year. The strength of a bee colony lies in its worker bees. Swarming is a natural reproduction process that is generally uneconomical. This is because large parts of the work force leave the colony thus making it weak. During the swarming season, queen is removed and kept in cage and the queen cells are destroyed. It takes about 10 days for the swarming period to recede and pass away. After this the queen is released into the environment. There is an external threat from enemies and pests. There is a dearth of floral broods. There is a scarcity of food. Timing of desertion varies from place to place. It depends on the climate and weather conditions. Providing artificial feeds like sugar syrup can help prevent desertion. Recent research has found that insecticide used in orchards is a great threat to honeybees and it causes desertion and mass death of honeybees. The best practice is to keep the beehives near the organic farms that are practicing integrated pest management. Colony migration is performed by beekeepers under adverse climatic conditions and lack of floral forage. The Central Bee Research and Training Institute has developed a time-table for bee colony migration. Generally honey is harvested at the end of flowering season. Traditionally the hives are puffed with smoke so that the bees fly away. Then the combs are removed and squeezed in cloth to extract honey. In case of clay pots, the pots are broken and the comb is squeezed. In wooden bee hives, honey is accumulated in the honey chamber. When one honey chamber is full and the honey is ripening, another chamber is inserted just below the filled chamber and just above the brood chamber. This process is repeated as and when each chamber gets full and the honey is left to ripe naturally. Once the combs start getting sealed, it is an indication that the honey is ripe and that it is time to extract them. The hives are then smoked and bees are dropped back into the hive by jerking the frame. The honey chambers or frames are then gathered and brought indoors for extraction. The sealing is cut open and kept into the honey extractor machine. The extractor is rotated at 300 rpm and the honey flows out owing to the centrifugal force. The frames are then placed back in the movable hive. Beekeeping in India is thus an important agri-business that not only promises good returns to the farmers but also helps increase agricultural productivity. Honey bee farming in India is also a good source of income for the farmers especially during the period when the growth of crop is still under process. However, a good amount of training and trials are required for a successful honey bee farm. Most useful article on Indian Beekeeping. It must help the new entrepreneur wish to start Apiculture. Thank you Ronendra for your comment. Hey! I have a very strange question? How can we get the bees to a certain spot for them to live there and make honey? The reason I ask this is because I have been having lot of bees making bee hives on my house walls. How can I divert them to a particular spot? I would like to experiment with keeping a few boxes for bee keeping. I have about 20 acres in a place close to Murud -Janjira which is near Alibaug. We have about 120 mango trees, 200 coconut palms and a host of other jungle varieties. We also cultivate rice during the monsoon. What would it cost to make a small beginning with say two boxes. What about training personnel etc. Please let me have a comprehensive quote. Talk with expert to get consultancy service on beekeeping. If you want professional consultancy service then talk with our expert. Is it possible to get a bee hive for my house? I am interested in beekeeping and farming.